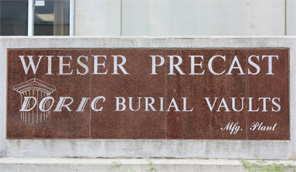 Wieser Precast-Doric Vault is a third generation-family owned and operated business. Our family has been serving the Tri-State area of Minnesota, Wisconsin, and Iowa since 1969. We manufacture, deliver and install pre-cast steps, ornamental railings and spiral staircases. We enjoy working with our customers to create custom concrete and steel products. We also provide Doric brand burial vaults, urn vaults, and cremation urns to funeral homes. Please contact us for any questions you have regarding our services. Our design professionals are happy to assist you with your custom design of concrete or steel products for your home or business. Visit this section to view some of our previously installed custom orders. We work often with area builders and contractors to provide quality products for your customers’ needs. Visit this area to view some of these steel and concrete products. urn vaults, and cremation urns to funeral homes. Visit this section for more information on our services.